If you wish to be accommodated in nice and homely environment, our cheap apartment hotels in Budapest and countryside are suitable alternatives. Accommodations on our HotelTelNet website are selected places, fitted with all convinience functions, delivering high quality services. Our cheap Budapest apartments are located in frequented streets near to the city center. Their additional advantage according to hotel rooms is, that they provide larger living and moving places, also they are eligible for business purposes. There are fully equipped kitchen and bathroom, even towels and bedcloths are at hand. Access to the hotel's restaurant and drink bar is for our guest enabled. Guarded parking and 24-hour reception complete our lodger's comfort. The 5-star Adina Apartment Hotel in Budapest provides the perfect mix for business and pleasure, offering the comforts of home combined with the services of a hotel. Spacious, air-conditioned and fully serviced apartments are awaiting the guests for a night, a week or more. 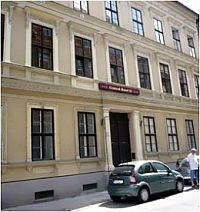 Hungary Budapest 5 star hotels apartments online booking. The 4-star aparthotel City Hotel Budapest welcomes its guests in the heart of Budapest offering 22 different sized apartments. All apartments have a fully equipped kitchen, individual heating setting, telephone and cable Internet connection. Guests arriving by car can use the underground garage free of charge. Central Hotel 21 *** is one of the newest 3-star hotels of Budapest, is situated in the downtown, in the vicinity of Blaha Lujza Square. Central Hotel 21 *** is an ideal place either for business travellers or tourists longing for relaxation in Budapest. Due to its central location the tourist attractions of Budapest and any part of the city are easily and quickly accessible from the hotel. The newly-built Comfort Apartments are located in the downtown of Budapest, about 2 minutes walk from Andrassy Street, in the vicinity of the most popular sights and the shopping area of Budapest. Comfort Apartments await the guests with one-, two- and three-roomed, fully-equipped apartments, a fitness studio and a deep garage under the building, would it be a family holiday, a business trip or a pleasant, longer journey in Budapest. The 3-star Hotel Corvin is located just a few minutes’ walk from the heart of Budapest and River Danube. The hotel has easy access from Budapest Ferihegy Airport and from highways M1-M7. The hotel offers air conditioned rooms and charming apartments with kitchen. The hotel has own safe parking area and in the lobby wireless Internet access is available. from €35.5! Special offer! Free night: 7 = 6! The 3-star Hotel HAPPY Apartments *** situated about 4 kms from the downtown in Budapest offers 20 different-sized apartments, from 35 m² up to 80 m². The apartments with larger ground floor have 2 independent sleeping rooms. Each apartment has top-level and practical furnishment, air conditioning and well-equipped kitchen. The apartment house has an underground garage where guests can find safe place for their cars. 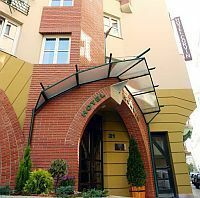 The three-star Hotel Romai is situated at Romai Part, a small part of the bank of River Danube known as one of the most popular place to visit in Budapest. The hotel awaits its guests with 37 comfortable rooms and apartments, own restaurant and a wide range of programs and sport facilities (tennis, kayak and canoe rental, mini golf, jogging track). The conference rooms of Hotel Romai are ideal venues for any kind of events up to 100 persons. from €40! Special offer! Free night: 4 = 3! The 3-star Hotel Zuglo is located in the green belt of Budapest, in Zuglo, near Heroes’ Square and City Park. Air conditioned double rooms and apartments are at the guests’ disposal. The restaurant of the hotel offers the specialties of Hungarian cuisine. Fitness – wellness services: swimming pool, sauna and jacuzzi. 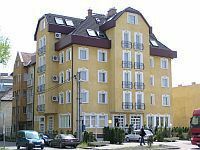 Hotel Zuglo has great traffic facilities: the hotel is situated near M3 motorway and has easy access by public transport. from €40! Special offer! Free night: 7 = 6! 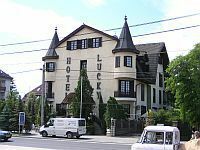 The 3-star Hotel Lucky *** is situated in the green zone of Budapest in the vicinity of M3 highway. Hotel Lucky with its comfortable rooms and air conditioned apartments with kitchen meet all requirements of businessmen, tourists and travellers in transit. The hotel’s comfortable restaurant, quiet conference hall, its drink bar, terrace and beer-garden meet every possible demand. The hotel offers parking places for guests arriving by car. The Six Inn Hotel Budapest *** awaits its guests in the heart of Budapest since the spring of 2013. The hotel is situated a few minutes walk far from Western Railway Station and also from Andrassy street, in Rózsa Street of District VI. The hotel is ideal for relaxation, sight-seeing or business tours. 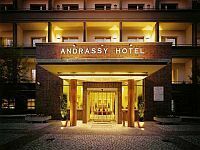 Mamaison Hotel Andrassy **** superior awaits its guests in the downtown of Budapest, at Andrassy Road, which is part of the World Heritage. One of the most beautiful boutique hotels of Budapest, Mamaison Hotel Andrassy is at the guests' disposal with superior rooms, an elegant restaurant, exclusive business services and meeting rooms of different sizes. 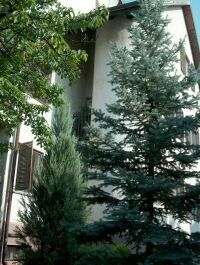 Private room, for 2 persons, in the green area of Budapest in a picturesque environment. 7 km from the city centre. Closed parking. The 4-star Europa Hotels & Congress Center - Superior hotel & congress center, situated on the Buda side of Budapest in the greenbelt of the city, offers 77 apartments and 13 studios. 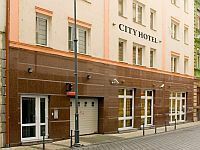 The former Aparthotel Europa provides easy access to the city center and the main attractions. 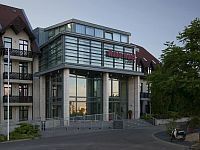 Connected to the hotels, the Europa Congress Center offers distinctive meeting and banquet facilities. Totaling 7000 square meters, its nine conference and banquet rooms with a wide range of set-ups can host groups from 15 to 520 people. Budapest’s newest all-suite hotel Queen’s Court Hotel & Residence is located in the centre of Budapest. The 5-star luxury hotel features 71 individually designed spacious suites ranging from a 28m² studio to a 80m² two-bedroom suite. The building's ground floor features a retro classical styled SPA comprising an in-door heated swimming pool, dry-sauna, jacuzzi and a fully equipped fitness center. The in-house restaurant and bar offers the very best in Hungarian and international cuisine. 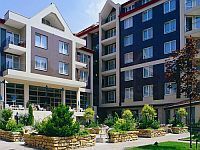 The Hotel Park Inn Budapest thanks to its excellent location, in the near of Vaci street and Duna Plaza, are suitable for satisfying the requirements of both business and leisure travels. Bliss Wellness Hotel Budapest is located in the heart of the capital in Ó street, on the 'Pest Broadway'. The former City Home Residence, renovated and reopened under the name Broadway Hotel awaits the tourists and the business travellers with 28 well equipped apartments with kitchen. Besides the one- and two-roomed apartments, the 4-star superior Hotel Bliss offers a restaurant, an 800 m2 large wellness and fitness centre, deep garage and an event room. 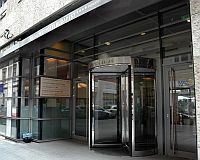 Furthermore a dance studio and a beauty parlour are at guests' disposal in Bliss Hotel Budapest. 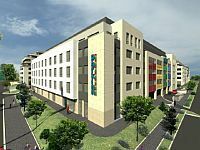 Pension Liechtenstein is located in the heart of Budapest, only 300 metres from the Europe famous Dohany street Synagogue and only 5 minutes walking distance from Vaci street (pedestrian area) and Deak square. All rooms are equipped with private shower, toilet, kitchenette, TV, telephone, wifi Internet access and air conditioning.